Model T Ford Forum: Was carpet ever available for the Model T touring? 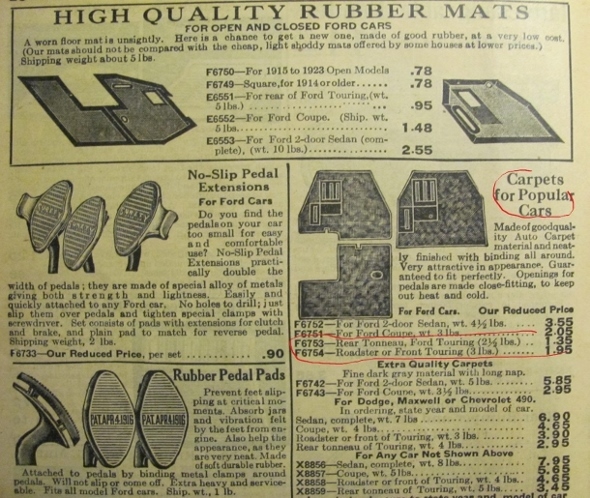 Was carpet ever available for the Model T touring? Model T Ford Forum: Forum 2018: Was carpet ever available for the Model T touring? I have a 1925 Touring and was wondering if it would be period correct to install carpets instead of the rubber floor mats? Open cars utilized mats - closed cars used carpet. 1923 Western Auto, carpets for Ford touring and roadster! And the early T touring had fiber mats for the rear, and many cars of the period used cocoa fiber mats too. I do know that 1916 and 1917 tourings had a wool rug in the back. I believe that this was continued through the 1922 model year.